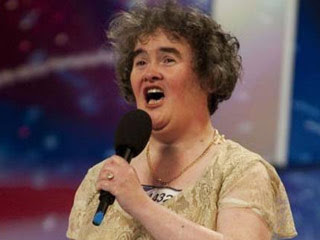 By now, everyone on the planet with a television or an Internet connection has heard the heartwarming, bring tears to your eyes story of Susan Boyle and her unlikely skyrocket to fame. I was at home getting ready for work, listening to the news, when the story played on CNN. Like the judges, I was ready to roll my eyes and prepare myself for another William Huang moment. Then she started to sing... and tears popped into my eyes. I was thrilled and speechless. My first thought, after recovering my breath: how lovely her dream has come true! My second thought: wait, what this really represents is a lesson in going after one's dreams. Here she is, one of the unlikeliest characters to win the 'BIG DREAM'. By current cultural standards, especially those involving TV appearances: 1) she's past her prime age-wise, 2) she is not a stereotypical beauty, 3) she's from the middle of nowhere. In other words she is the exact opposite of the 21 year old, lithe, blond ingenue who gets 'discovered' in New York or LA or on American Idol. So, yes, she had all the classic strikes against her and had she remained in her peaceful little village, she likely would never have had this stunning moment. But she took a chance. Something in her soul gave her the courage to swagger out on stage, scold Simon Cowell, then open her mouth and let the magic begin. But the magic would never have happened if she had not taken the first step and gone to that audition to pursue her dream when everyone else thought she had no chance. What courage it must have taken to stand on that stage, knowing that others were laughing at her audacity. That is the real joy and the lesson. What dream do you need to let loose? I can't tell you how many times I've watched that video. (And cry just about every time...) But I've taken away the same thing from it. She's proof that it's never too late if you go after what you want. She has such an amazing voice. Gives me goosebumps.